Most think racing goes to sleep after the Breeders’ Cup. I can see why they would think such a thought, as how do you follow up the biggest weekend of racing? Well, for starters you can start looking at the upcoming tracks, as the cycle starts all over again. Another item on your “to-do-list” should be examining how you have done this past year, and what would you like to change. That should get you ready to break from the gate and grab the lead. Here are a few nuggets as you ready you game to go to the next level, and one to keep your feet on the ground. – Best of luck!! I would like to think I’m a pretty good handicapper. I have won contests, had some big days, and enjoyed the 2014 racing season immensely. But as the refs in the NFL would say during a play challenge.” After further review.” I can stand to change some things for 2015. When you want to know what separates the good from the great, all you have to do is look at this picture. Chad Brown is a class act, and I think we’re only seeing the tip of the ice berg. Remembering those who taught you their craft patiently, and with the guiding hand of a mentor. Most of the connections are still walking red-carpets, but some just recognize where they came from and want to share with those who meant the most. 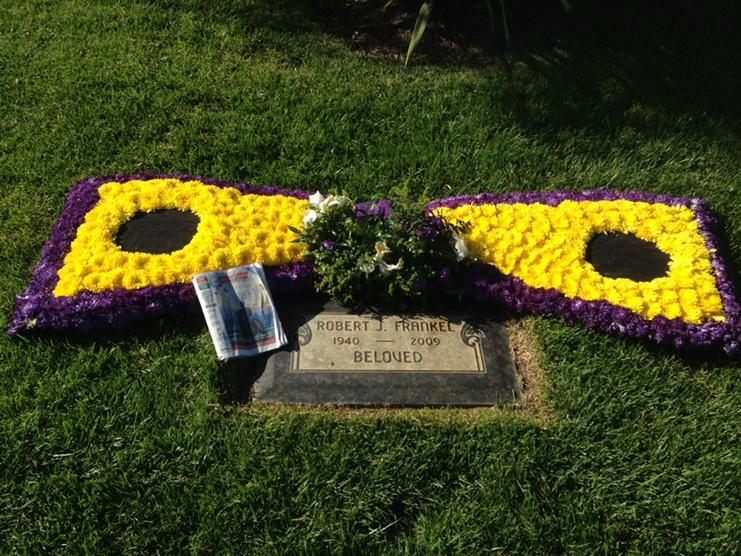 This Twitter picture from Christina Blacker says it all as Chad Brown pays tribute to his friend and mentor with his Breeders’ Cup wreath and program. With 2014 winding down and the holiday season just around the corner, this is no time to go to sleep. Thoroughbred racing is a year-round game that requires patience and a money management plan. Let Winning Ponies save you valuable time doing the leg work, and you spend your time deciding how to maximize your wagers. As a note, if you put in 30 minutes to handicap a race, you’ll need to spend the same amount of time deciding how to get your action in play. How many times have we seen very good handicappers turn a slight profit if any? They spend hours pouring over information and a few moments deciding how to us it. This fits under the heading of “what not to do at the races.” Let Winning Ponies bring you the best in racing information with the one-of-a-kind E-Z Win Forms. This will allow you to use the information that best fits your handicapping plan, and I’ll bet dollars to donuts it will be a matter of time before we see your name on the testimonials. The exotic predictions have paid $9.838,555.00 in 2014, and there are six weeks left to handicap this year! Never too late to get on board, and Winning Ponies wants you to decide for yourself. If you are still on the bubble, just take a look at the Winning Ponies results and in real time you’ll be able to see how their selections are doing. If you decide to get in the game later in the day; no problem! Winning Ponies only charges for the races that are used versus other data providers who charge for races that are in the books. HA! handicapp the PA BIG FOUR number, so I can bet $3000 a race too.